Waves lapped lazily over the dark rocks of the Tsunami Flats, their wet, porous surfaces casting a million fractured reflections of the afternoon sun. Aguar the Shallowseer waded through the tide pools. His son followed more hesitantly, struggling not to slip on the wet stones. More than once, the Guardian intervened to prevent a tumble, using his great wings as stabilizing arms for Kamak lean against as he regained his footing. "Are we nearly there, father?" Kamak asked exhaustedly. "Yes, my boy," he grunted, heaving a shoulder under his son's back legs and boosting the youth up a tall rocky outcropping. Aguar looked back and watched as his Pearlcatcher daughter traversed the rocks and pools with surefooted grace. She was small for her age, but even with a heavy pearl hanging from a sling around her neck, she hopped from stone to stone amid swelling waves and buffets of wind. Splash waved at him as she caught his gaze. They were travelling to the divination cave known as the Shoredeep Presage, where Kamak was to divine his first revelation and ascend to Junior Oracle. Although the young Guardian had proven himself skilled at swimming and fishing the waters, he had yet to display any prophetic abilities. Aguar heaved a sigh, hoping the dormant talent would present itself today. By sunset they had reached the cave. The tide had come in, submerging the cave’s mouth up to the stalactites. Going first, Aguar demonstrated how to descend carefully into the chop, using the well worn hollows in the rock faces as handholds to progress. The current here was too strong for any but the fittest to safely swim, so elders of the shoreline clans had taken risky efforts to carve out grips that would see oracles safely to the grotto inside Shoredeep Presage. Kamak and Splash followed him into the cool pocket of seawater, mimicking his movements until the cave’s path inclined and the water level receded. The family followed the path to a chamber lit by a series of decorative braziers, each constructed of large sea shells and dried coral. At the very center of the room was an enormous pool, carved directly into the stone floor. Its surface was still, a perfect darkened mirror. The flame’s reflection danced in the circular pane, bouncing warm light across the ceiling in a wavy aurora. At the edge of the pool closest to the grotto’s entranceway was a raised dais holding an empty basin an and assortment of vials and reagents. "Are you ready, Kamak?" Aguar breathed out, standing slightly behind his son. The young Guardian’s jaw quivered, but he eked out a "Yes", hungry for his father’s approval. 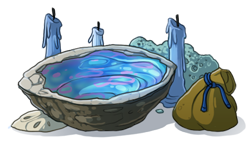 "Just like we talked about, you must perform the divination ceremony at the small basin," stated Aguar, "and then you must descend into the pool as far as your wings will take you." Kamak visibly swallowed, but nodded slowly. To his side, Splash placed a petite hand on his wrist and whispered, "You'll be fine! You can swim currents that are much stronger than I can! I bet you’ll be able to reach the deepest prophecies!" A layer of nervousness melted away at his sister’s enthusiasm, and he approached the divining basin. The bowl was fashioned from an enormous mollusk shell, the inside polished to a beautiful sheen. Beside the shell were various extracts, powders and concoctive additives with which to perform the ritual. Remembering what he had painstakingly practiced in their home lair, he began to mix, grind, and burn the elements needed to begin the ceremony. Aguar’s chest swelled with pride as he watched his son perform the ritual flawlessly. Splash watched in wonder as her brother reached up to tie the seer's sash around his eyes and repeat the incantation. Once he was finished, he lifted the blindfold and looked to his father for wordless direction. Aguar nodded, it was time. Kamak slid into the pool, scattering the pristine surface, and disappeared from view. Beneath the water, the pool gave way to a great tunnel stretching and winding its way down to the cold, silent depths of the Leviathan Trench. The holy passage carried, by way of bubbles and currents, the prophecies and revelations of the Tidelord and his most trusted subjects. Deepsea oracles of immense power would help deliver word from their patron deity, and this cave was the means with which the shallows clans divined. If Kamak could not hear the voices of the Tidelord and his ilk through this conduit, there would be no future for him as a seer. An hour passed, and Aguar's heart started to race with anxiety. Normally, the rites would take no longer than half that time. Splash had moved closer to the pool, eyes transfixed on the surface, until she squealed with glee; a great spout of water erupted from the hole. Kamak broke through, claws scrambling to find purchase on the edges of the pool. Aguar rushed to help, gripping his son's forelegs and guiding him onto the stone floor. Kamak was breathing raggedly as he transitioned to taking in air once more. He rolled over and faced his family, a grin plastered across his face. "What did you hear, brother?" Splash was wiping droplets of water from his eyelids. "Oh no no, young one, " said Aguar, "The first revelation is a secret you carry to your grave. Don't worry, in just a few years, you’ll receive one too. Judging by your brother's expression, it looks as though his was one worthy of the effort." The shores of the Sea of a Thousand Currents were typically calm. The fresh water acted as a safe playground for hatchlings learning to swim and breath the water. Gentle dollops of cloud cover would hang over the sea, delivering healthy drizzles of rainfall each spring. It offered protection for the dragons who lived there, shielding them from the harsh pelagic violence of the outer saltseas. That all changed in a turn of the moon. A day after Kamak's initiation, the sky darkened with angry storm clouds. As they collided, crashes of thunder rocked the seascape. As the inclement weather stirred itself into an all-out hurricane, a supercell that resembled the Twisting Crescendo began to bear down on the shallows, tearing roofing off of fishing shacks and ripping terrestrial lairs to shreds. Kamak shouted to Aguar over the deafening howl, "Father! Are we safe here?" Aguar cast his gaze across a sea that was rising and falling with frustrated swells. No one in the clan had received word of this frightening gale, either through divination or word-of-mouth. The wind was coming from the wrong direction. As they left their shallow cliffside lair and moved along the walkway leading to the deeper tunnels, Aguar shielded his children with his great wings from the worst of the wind. Along the coasts of the Tangled Wood, the tide violently attacked the beaches, pulling driftwood huts and makeshift boats beneath the waves. The body of water itself had become a monstrous vortex, as if it was draining into the seafloor. But outside of the great whirlpool, the sea level was rising rapidly. “FATHER!” shrieked Splash, “IT’S MOVING!” The walkway buckled, several supports near them snapping, causing the structure to drop to an incline. Splash slid out from under Aguar’s wing, claws tearing deep tracts into the collapsing platform. She managed to grasp a rope railing with one claw, her pearl with the other, trying to hold onto both as the platform shuddered violently in the wind. Kamak pushed away from Aguar and reached out to Splash, wrapping a wing around her just as the raw power of the storm consumed the walkway, dropping the dragons into the hungry waters below. Aguar floated beneath the waves. His body was wracked with pain, and it took him several moments to get his bearings. He didn’t know how long he'd drifted, or where what had happened to his family. Great wings churned the water as he peered into the depths, panic taking hold. But it was murky and thick with debris. He could not see. “Kamak! Splash!” he shouted as he broke the surface. There was no response. The storm had died down, though the winds were still treacherous. Taking to the sky, Aguar patrolled the coast, calling out for his children. The forms of many cliffside dwellers dotted the shore, but none were his hatchlings. Finally the Guardian spotted Kamak’s seafoam coloring, his smaller form curled into a shallow cave along the rocks. As Aguar approached, he saw his son was weeping, scaled shoulder shaking as he sobbed. Aguar landed in front of his son and looked around. There was no sign of Splash. "Kamak, where is your sister?" Kamak swung his head slowly around, tears streaming from his ocean-blue eyes. "She's gone, torn from my claws. I lost her. I... I failed. I'm so sorry!" Aguar stood motionless for a moment, fighting back panic. Kamak was clutching Splash’s pearl tightly to his chest. Splash was never without it. "Stay here," said Aguar, as he leapt to the mouth of the cave. Aguar turned away without a response, leaping out into the unfamiliar wind. Though the sea continued to churn, the low tide gave Aguar ample room to enter the Shoredeep Presage. The tide pools were bone dry in the chill morning air. He landed painfully at the cave's mouth and ran inside, heart pounding. The braziers had all been extinguished. Situating himself in front of the basin, Aguar produced divination reagents from a pouch around his neck, and began the ritual. The water level flagged; he would have to plummet down the tunnel before he encountered the water's surface. Ingredients laid out in a neat procession, the Guardian lifted the sash to his great head and tied it in place. He felt around for the stony lip of the pool and took a steadying breath. If Splash is alive, the Tidelord will tell me her whereabouts, he thought with conviction. The rational part of his mind knew that the deepsea prophecies would tell you whatever they deemed necessary, and did not honor requests. He braced himself above the pool, then dove, closing his wings and pulling his legs in tight against his body to avoid scraping the tunnel walls as he fell. The shock as the cold water enveloped him drove the air from his lungs, replacing it with liquid. Without the use of his sight, he would need to feel for the chill and pressure of the deeper waters and swim downward through the disorienting, twisting path. Having done this hundreds of times before, Aguar pulled himself through the water, following the arc of the tunnel as it continued into the depths. Deep in his gut he knew something was wrong. The water, though cool, was not the frigid stream he was used to. At this point in the tunnel, he should be receiving the first prophecies and revelations, but there came... nothing. An eerie silence pervaded. Even without the echoing voices from below to guide him, Aguar frantically swam deeper, scraping his legs and wings painfully along the rock tunnel. Minutes dragged on as he made his wild descent, but no words came to him. As the pressure became unbearable, he had to turn back. He ripped off the divination sash and his eyes were met with impenetrable darkness. He let his own buoyancy take him home, the burden of his failure carried with him to the surface. The seer crawled slowly out of the pit, coming to rest on the edge of the poolside. He stared down at the water, a haunting reflection of his own face looking back up at him in grief. Without turning, he could tell that someone else had entered the cavern. There was a long silence before Kamak spoke. "Did the Tidelord tell you what became of Splash?" he asked, his voice quivering with hope. Aguar's dead expression never lifted from the well. "Nothing. There was nothing. He speaks no more."